OK, I found a photo that Mary took of our turkeys when they were poults. Verrrry cute little birds. And out little ones really liked to play with them. They were, as I wrote, the Broad Breasted Bronze, which is similar in many ways to the wild turkeys here in MN. We used the largest roasting pan we own. The little ones stuffed the turkey. Note the size compared to the girls. It weighed more than Inge or Donna. We had to cover the roaster with Al foil. Mary, the little ones and I got it ready and in the oven at 7am. It was done at about 1pm at 350. But because the temp was high and time was short we didn't do the "low and slow" method--but the meat was fall-apart tender and delicious. Below is the left breast. 11" at longest, 6" widest, 4" deepest. The serving plate held only this breast and the left leg, and a small part of the giblets. I bonded the rest of the bird and put the bones in the crock for broth. With home made cranberry sauce, yams from scratch, mashed potatoes, turkey gravy, and the pies (pican, coconut custard, and lemon merangue) it was hard to get outside after eating to clean the garage and drive the fence posts for the chicken coop. Turkeys are really cute as chicks. When they grow up, well, for most people, they are not so much cute. We bought 2 turkey chicks last spring. We kept them in a washtub under a light in the dining room for a short time. They whistled their ascending three tone call and started jumping out of the washtub. So I built a lightweight cage (4'x2'x8') to keep them in the yard. We clipped their flight feathers. One was Righty, the other, Lefty. Lefty died in a storm in May. So only Righty was left. So, we renamed him "Thanksgiving Dinner". Turkeys can be very mean. So I made sure that TD was given attention every day. He was a very gentle turkey and liked to be held and petted. The Sunday School and Wednesday School kids would often play with him and pet him. Though, some of the kids were afraid of him, because they knew what their folks said: Turkeys can be mean. TD helped me build our hen house. I think our friend Gus became a bit intimidated by TD's affection. While Gus was helping me with the hen house, he decided to put TD outside the pen. TD would come up to him and chuff, warble, and gobble. TD was a free range bird. So we didn't buy very much feed for him. We had to move the pen often. Because turkeys are like geese considering the amount of excrement they generate. Turkeys can make good pets. If they are handled frequently. Perhaps TD was a bit confused, he really liked people. And my dad really liked him. He said goodbye to TD last of all after all our kids before he and mom left when they visited this past summer. 2 Bronze Broad Breasted turkey chics at $10 each. TD's dressed weight is about 35 lbs. Even with the loss of one turkey that's still under $1 per pound. Dressed turkeys were $1.78 per pound at Wall Mart when I checked today. 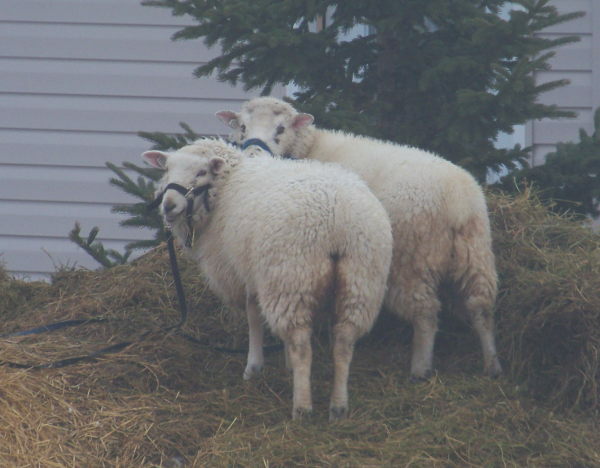 From August 2010 to September 2011 we raised two lambs for food: one ewe one wether (castrated). My original intent was raising them to feed our family, but they were also really wonderful pets. I decided to raise sheep rather than goats or a calf for several reasons. Goats climb. And goats eat almost anything. It would have been impossible to keep goats from eating shingles or siding off the house or church. As it was, the winter snow prevented us from keeping the sheep in a pen. Goats would have been impossible. A calf would have taken much more food than sheep needed, plus liquid water through the winter. Sheep, like goats, don't need water. They can use snow and ice very well. We bought 2 large round bales of hay and 1 of straw for the winter. The sheep stayed by the house near their hay through the whole winter. In the spring we had to catch them a few times and tether them to keep them from eating the buds of hay from our neighbor's field. That provided some exercize for Mary and me. But they weren't bad for wandering off. Based on what we learned, if we could regulate their feeding better we probably could have gotten by with only one bale of hay. The sheep stand on their food and so quite a bit went to waste. In the spring we needed to sheer them. I borrowed a clippers but found out that I couldn't do it. I either because I lacked the skill or because the sheers wasn't sharp enough. But a neighbor helped us out. 2 lambs at $40 each. 2 Hay bales and 1 straw, total $70. That would make it $260. The wether at dressed hanging weight was just over 70 lbs. The ewe was almost 80 lbs. That's $0.93 per pound dressed weight and $1.79 per dressed weight including the fencing and tethers. All around a very good investment for the price of meat. One great advantage with sheep, we didn't have to mow the lawn as much, and that cut down on the cost of gasoline for lawn mowing. I'm not sure how to calculate this into the cost of the meat. But it was a good benefit. We enjoyed having Rammy and Ewey as pets. I served a bit of Ewey to our Bible Study group. We were studying the book of Exodus, and none of the Bible Study students had tasted lamb before. I think they all liked it. Thanks to Mr. Malwitz and Podocheck for sheering and sheers. Thanks to the Sippers for help with dressing the lambs. Thanks to Sara and Betsy for the lambs. And thanks to Glenn Vettleson for the fencer, and Darrow Lundeen for the fence posts. Thanks also to Drs. Hagan and Bovee for their vetrenary help in my ignorance. I've read Alfred Wight's books (James Herriot's series "All Creatures") but that's not a substitute for real experience. Now, due to my inexperience I burned out the fencer using improper grounding techniques and copper conductors. We'll get a replacement this spring. Hopefully for under $50. Sarah and Betsy have three more lambs for us coming this spring. If we get those lambs, we'll have them just for the spring through fall. All in all, I enjoyed having the lambs. And I'm very glad that we could grow our own food inexpensively. Now I know more about shepherding. That's not an insignificant thing for a Pastor. The transcription is found at this link. This hymn is number 601 in the old Lutheran Hymnary (1913, 1935 Augsburg) of the Norwegian Synod and the Evangelical Lutheran Synod; number 607 in The Lutheran Hymnal (1941 Concordia) used by the churches of the old Synodical Conference; number 209 in the Wisconsin Evengelical Lutheran Synod's Christian Worship (1993 Northwestern). “Nor is it hard to account for its popularity. The meter so grandly devised, of which I remember no other example, fitted though it has here shown itself for bringing out some of the noblest powers of the Latin language—the solemn effect of the triple rime, which has been likened to blow following blow of the hammer on the anvil, the confidence of the poet in the universal interest of his theme, a confidence which has made him set out his matter with so majestic and unadorned a plainness as at once to be intelligible to all,—these merits, with many more, have given the Dies Irae a foremost place among the masterpieces of sacred song.”—Sac. Lat. Poetry, 1874, p. 302. It is well known that the Revolution in Paris in 1848 led to many scenes of terror and shame. Foremost was the death of Monsigneur D. A. Affre, the Archbishop of Paris, who was shot on June 25 on the barricades of the Place de la Bastille whilst endeavoring to persuade the insurgents to cease firing, and was buried on July 7. As soon as it was safe to do so, his funeral sermon was preached in Notre Dame, accompanied by a religious service of the most solemn and impressive kind. Throughout the service the archbishop’s heart was exposed in a glass case in the choir, and at the appointed place the Dies Irae was sung by an immense body of priests. The terror of the times, the painful sense of bereavement which rested upon the minds of the people through the death of their archbishop, the exposed heart in the choir, the imposing ritual of the service, and the grand rendering of the Dies Irae by the priests gave to the occasion an unusual degree of impressiveness. 1. Day of wrath, O day of mourning! 3. What shall I, frail man, be pleading? Ere that day of retribution! Leave me not sin's damnation! Hear, O Christ, Thy servant's groaning! Thus to me tru hope vouchsafest! 6. With Thy favored sheep, oh, place me! On Thy cross; O Christ, upbear me! Spare, O God, in mercy spare me.